A mudra ( i/muˈdrɑː/; Sanskrit मुद्रा, "seal", "mark", or "gesture"; Tibetan: ཕྱག་རྒྱ་ THL chakgya) is a symbolic or ritual gesture in Hinduism and Buddhism. While some mudras involve the entire body, most are performed with the hands and fingers. A mudrā is a spiritual gesture and an energetic seal of authenticity employed in the iconography and spiritual practice of Indian religions. The Chinese translation is yin (Chinese: 印; pinyin: yìn) or yinxiang (Chinese: 印相; pinyin: yìnxiàng). The Japanese and Korean pronunciation is "in". According to Jamgon Kongtrul in his commentary on the Hevajra Tantra, the ornaments of wrathful deities and witches made of human bones (Skt: aṣṭhimudrā; Wylie: rus pa'i rgyanl phyag rgya ) are also known as mudra "seals". In Indian classical dance, the term "Hasta Mudra" is used. The Natya Shastra describes 24 mudras, while the Abhinaya Darpana of Nandikeshvara gives 28. In all their forms of Indian classical dance the mudras are similar, though the names and uses vary. There are 28 (or 32) root mudras in Bharata Natyam, 24 in Kathakali and 20 in Odissi. These root mudras are combined in different ways, like one hand, two hands, arm movements, body and facial expressions. In Kathakali, which has the greatest number of combinations, the vocabulary adds up to c. 900. Sanyukta mudras use both hands and asanyukta mudras use one hand. Therefore the goddess sleeping at the entrance of Brahma's door should be constantly aroused with all effort, by performing mudra thoroughly. In the 20th and 21st centuries, the yoga teacher Satyananda Saraswati, founder of the Bihar School of Yoga, continued to emphasize the importance of mudras in his instructional text Asana, Pranayama, Mudrā, Bandha. Rāmabhadrācārya meditating on the banks of the Mandakini River with fingers folded in the chin mudrā. The thumb and forefinger on each of the hands are joined, forming a zero. The rest of the fingers are extended. The hands are placed palms-up on the thighs or knees while sitting in vajrasana. This mudrā activates the diaphragm, making for deep "stomach-breathing" as the diaphragm pushes out the internal organs when it descends towards the pelvis on inhalation. Slow breathing in a 5-2-4-2 mentally counted rhythm (being; 5 the exhalation, 2 the breath retention and 4 the inhalation) causes prana flow in the pelvis and in the legs. The thumb and forefinger are the same as in Chin Mudrā. The rest of the fingers are folded into a fist. The non-folded part of the forefinger and the middle finger should still be touching. As in Chin Mudrā, the hands are placed palms-up on the thighs while sitting in Vajrasana. This mudra activates the ribs, making them expand sideways on inhalation. Slow breathing in a 5-2-4-2 counted rhythm ( being; 5 the exhalation, 2 the breath retention and 4 the inhalation) causes prana flow in the torso and in the throat. The thumb is folded into the palm, touching the base of the small finger. The rest of the fingers are folded over the thumb, to create a fist. The hands are placed palms-down on the thighs while sitting in Vajrasana. This mudra activates the pectoral muscles, making the chest expand forward on inhalation. Slow breathing in a 5-2-4-2 counted rhythm ( being; 5 the exhalation, 2 the breath retention and 4 the inhalation) makes prana flow in the throat and in the head. The hands are as in Adi Mudrā, but the palms face upwards and are located at the level of the navel, with the left and right knuckles and first finger joints touching. This is done while sitting in Vajrasana. Breathing becomes full: in inhalation, the diaphragm descends, the ribs then expand, and then the pectoral muscles move forward. Exhalation works in the same order, which creates a "wave" or ripple effect. A complicated mudra combining hand gestures, synchronized movement from gesture to gesture within the breath cycle, and meditation. The mudrā is practiced sitting in Siddhasana. Even a single breath cycle of this mudra can significantly stimulate the body. It is described in the book, Theories of the Chakras, by Hiroshi Motoyama. This gesture was used by the Buddha when attacked by an elephant, subduing it as shown in several frescoes and scripts. In Mahayana Buddhism, the northern schools' deities often paired it with another mudra using the other hand. The bhūmisparśa or "earth witness" mudra of Gautama Buddha is one of the most common iconic images of Buddhism. 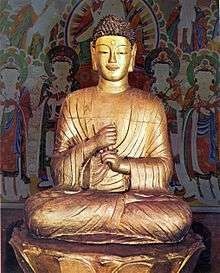 It depicts the Buddha sitting in meditation with his left hand, palm upright, in his lap, and his right hand touching the earth. It represents the Buddha asking Pṛthivi, the devi of the earth, that she witness his enlightenment when he was threatened by demon king Mara . The Buddha preached his first sermon after his Enlightenment in Deer Park in Sarnath. The dharmachakra or "turning of the wheel" mudrā represents that moment. 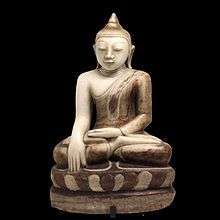 In general, only Gautama Buddha is shown making this mudrā except Maitreya as the dispenser of the Law. Dharmacakra mudrā is two hands close together in front of the chest in vitarka with the right palm forward and the left palm upward, sometimes facing the chest. There are several variants such as in the Ajanta Caves frescoes, where the two hands are separated and the fingers do not touch. In the Indo-Greek style of Gandhara, the clenched fist of the right hand seemingly overlies the fingers joined to the thumb on the left hand. In pictorials of Hōryū-ji in Japan the right hand is superimposed on the left. Certain figures of Amitābha, Japan are seen using this mudra before the 9th century. The Dhyāna mudrā ("meditation mudra") is the gesture of meditation, of the concentration of the Good Law and the saṅgha. The two hands are placed on the lap, right hand on left with fingers fully stretched (four fingers resting on each other and the thumbs facing upwards towards one another diagonally), palms facing upwards; in this manner, the hands and fingers form the shape of a triangle, which is symbolic of the spiritual fire or the Triratna (the three jewels). This mudra is used in representations of the Śākyamuni Buddha and Amitābha Buddha. Sometimes the Dhyāna mudrā is used in certain representations of Bhaiṣajyaguru as the Medicine Buddha, with a medicine bowl placed on the hands. It originated in India most likely in the Gandhāra and in China during the Wei period. This mudra was used long before the Buddha as yogis have used it during their concentration, healing, and meditation exercises. 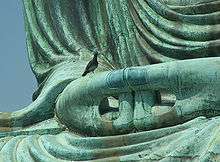 The mida no jōin (弥陀定印) is the Japanese name of a variation on the mudra, where the index fingers are brought together with the thumbs. 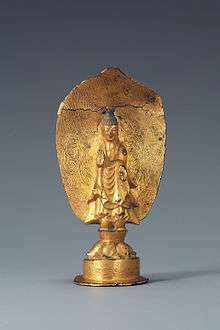 This was predominately used in Japan in an effort to distinguish Amitābha (hence "mida" from Amida) from the Vairocana Buddha, and was rarely used elsewhere. The Varada mudrā "generosity gesture" signifies offering, welcome, charity, giving, compassion and sincerity. It is nearly always shown made with the left hand by a revered figure devoted to human salvation from greed, anger and delusion. It can be made with the arm crooked and the palm offered slightly turned up or in the case of the arm facing down the palm presented with the fingers upright or slightly bent. The Varada mudrā is rarely seen without another mudra used by the right hand, typically abhaya mudrā. It is often confused with vitarka mudrā, which it closely resembles. In China and Japan during the Northern Wei and Asuka periods, respectively, the fingers are stiff and then gradually begin to loosen as it developed over time, eventually leading to the Tang dynasty standard where the fingers are naturally curved. The Vitarka mudrā "mudra of discussion" is the gesture of discussion and transmission of Buddhist teaching. It is done by joining the tips of the thumb and the index together, and keeping the other fingers straight very much like the abhaya and varada mudrās but with the thumbs touching the index fingers. This mudra has a great number of variants in Mahayana Buddhism. In Tibetan Buddhism, it is the mystic gesture of Tārās and bodhisattvas with some differences by the deities in Yab-Yum. Vitarka mudrā is also known as Prajñāliṅganabhinaya and Vyākhyāna mudrā ("mudra of explanation"). The Jñāna mudrā ("mudra of wisdom") is done by touching the tips of the thumb and the index together, forming a circle, and the hand is held with the palm inward toward the heart. 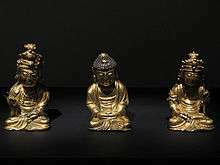 Joseon Dynasty figure on the left makes the Karana mudrā. The Karana mudrā is the mudra which expels demons and removes obstacles such as sickness or negative thoughts. It is made by raising the index and the little finger, and folding the other fingers. It is nearly the same as the gesture known as corna in many 'western' countries, the difference is that in the Karana mudra the thumb does not hold down the middle and ring finger. (This mudra is also known as Tarjanī mudrā; Japanese: Funnu-in, Fudō-in). Various Asian martial arts forms contain positions identical to these mudras. The use of mudra and other aspects of mikkyo are found in many instances in many koryu, because mikkyo and Shinto were the religions of the samurai who founded those ryu that were created before the 17th century. Subsequent ryu developed after the imposition of the Tokugawa government were heavily influenced by Neo-Confucianism, and then later by Zen Buddhism. Although Zen was popularized among the warrior class in the Kamakura period, the 14th century, it did not greatly affect martial arts until the latter part of the Edo Period, with the writings of the Zen priests Takuan and Hakuin. And even at that, Edo Period (1600-1868) martial arts were equally influenced by Neo-Confucianism and even, in the latter part, mystical Shinto. Mikkyo uses mudra most often in combination with various rituals, chants and so on. One common mudra is that of the "knife hand," or shuto. The first two fingers are extended while the thumb and other fingers are clenched. If you look closely, you may see this movement subtly hidden in some koryu kata, especially by old schools such as the Tenshin Shoden Katori Shinto-ryu, or in statues of divine Buddhist beings. This represents the sword of enlightenment, which cuts away all delusions. Sometimes the tips of the extended fingers are grasped in the fist of the other hand. There is a symbolic meaning for this, derived from mikkyo. ↑ Devi, Ragini. Dance dialects of India. Motilal Banarsidass Publ., 1990. ISBN 81-208-0674-3. Pp. 43. 1 2 Saraswati, Satyananda (1997). Asana Pranayama Mudrā Bandha. Munger, Bihar India: Bihar Yoga Bharti. p. 422. ISBN 81-86336-04-4. ↑ Buswell, Robert Jr., ed. (2013). Princeton Dictionary of Buddhism. Princeton, NJ: Princeton University Press. p. 2. ISBN 9780691157863. Shaw, Miranda Eberle (2006). Buddhist Goddesses of India. Princeton University Press. pp. 17–27. ISBN 978-0-691-12758-3. ↑ T.W. Rhys Davids Ph.D. LLD. ; Victoria Charles (24 November 2014). 1000 Buddhas of Genius. Parkstone International. p. 515. ISBN 978-1-78310-463-5. ↑ Japanese Architecture and Art Net Users System. "JAANUS / mida-no-jouin 弥陀定印". Retrieved 2 July 2016. ↑ written; Beer, illustrated by Robert (2003). The handbook of tibetan buddhist symbols (1st ed.). Chicago (Ill.): Serindia. p. 228. ISBN 978-1932476033. ↑ For translation of jñānamudrā as "gesture of knowledge" see: Stutley 2003, p. 60. 1 2 3 4 Muromoto, Wayne (2003) Mudra in the Martial Arts. . Retrieved December 20, 2007. Stutley, Margaret (2003), The Illustrated Dictionary of Hindu Iconography (First Indian ed. ), New Delhi: Munshiram Manoharlal Publishers Pvt. Ltd., ISBN 81-215-1087-2 Originally published 1985, Routledge & Kegan Paul plc, London. Dhiren Gala: Health at Your Fingertips: Mudra Therapy, a Part of Ayurveda Is Very Rffective Yet Costs Nothing. Navneet, 2007. ISBN 9788124603123.